ABT stands behind our listings. If we made a mistake and you receive the incorrect rotors, we will cover ALL costs and get you the parts you need. If the rotors were ordered incorrectly and the compatibility information does not match your vehicle, we will accept the returned rotors in exchange for the correct ones. However, all shipping costs are the responsibility of the buyer for all returned merchandise under any circumstances. Items must be returned within 60 days, and refunded Money Back. Please see your local post office for the cheapest rates for returning packages. PLEASE TAKE GREAT CARE WHEN PLACING YOUR ORDER. THE COMPATIBILITY TAB IS SPECIFIC AS TO WHICH VEHICLES THE LISTED PARTS WILL FIT. IT SHOULD ALSO BE NOTED THAT THE COMPATIBILITY TAB MAY OR MAY NOT HAVE ALL SPECIFIC INFORMATION ON CERTAIN CAR MANUFACTURERS, IT IS RECOMENDED THAT THE BUYER CONTACT THE SELLER FOR CONFIRMATION ON PART ACCURACY. Carefully inspect your parts before installiion as used parts will not be accepted for return. We will always go the extra mile to accomodate any issues you may have. If we have mis-listed or sent you incorrect parts (part # on the rotor buyer recieves does not match rotor that is in the eBay listing and the the labels on the boxes), we will quickly correct the issue hassle-free to you. Contact us via email or phone if you experience any problems or for an return authorization number. Returned rotors must be packed in a similar sized box (if original is opened and torn). Please stack both rotors facing each other i.e. hubs/caps touching. Place some cardboard between the two rotors for protection and stuff any necessary foam, newspaper, etc. to help cushion the rotors while they make their return.. It is the buyers responsibility to contact the seller immediately on any of these issues. Used and severely damaged rotors will not be accepted as returns and will not be fully refunded unless it is covered by the warranty. All rotors manufactured by Advance Brake Technology carry a 1 YEAR Warranty from the time of purchase against cracking and warping unless otherwise stated in the listing. Please keep all invoices and proper documents filed. Any orders older than 6 months require full proof of purchase in either (1) the printed invoice that came with the original order or (2) a printout of the eBay sales record number and date of purchased (found on your 'My eBay' page). 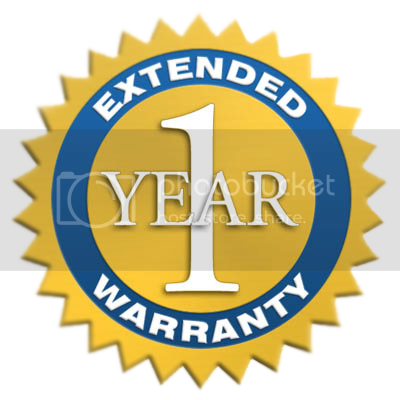 Warranty includes: Full replacement of brake rotors and/or pads, and a complimentary zinced treatment in any variation at buyers request with FREE shipping. Disclaimer of Warranty: If your brake rotor has turned blue due to excessive heat generated during improper brake-in or due to failed braking components such as a seized or hanging caliper, this warranty will be voided. This is an obvious situation and not a failure of the brake rotor and is not covered by warranty. Any other problems such as incorrect installation resulting in damaging the rotor is primarily the consumer's problem and we will not offer refunds or exchanges for these issues. Please have a professional mechanic install your brakes. We are also not responsible for any mechanic fees that occur.